Forum Index > Off-topic Talk > Self defense knife for best friend. Posted: Thu 01 Aug, 2013 4:20 pm Post subject: Self defense knife for best friend. Hi Everyone, I just gotten back from a flea market and bought four old saw blades. I planning on using those to create two knives, one for myself and one for my best friend. I'm going into my senior year in college and after this I might not be able to see my best friend again. What do ya'll think would the best design, size, etc, for a knife for self defense with utility for delicate percision cutting for a girl who is around a half a head shorter that me, who is 6 foot 1? While I advise against carrying a knife of any kind for self defense, a basic and fairly broad classic dagger form at least four inches of blade. A wide blade allows for a decent grind for utility as well as poking. If you are going with saw blades, something like the western W77 comes to mind. Simple profile and slab handles. To boot (heh), a belt/boot or pocket clip sheath will keep it handy. Height is fairly irrelevant when considering concealed or open carry knives. Others will laud a kerambit or other recurve profile but a basic broad dagger is the most useful overall. Just a note that the current W77s are pretty lousy steel and the grinds asymmetrical but they are what they are, a good short dagger with enough width to sharpen well. A knife seems like a poor choice for a self-defense weapon. Any wound that is likely to disable an assailant is also likely to kill them. Is your friend prepared to take someone's life? And potentially go to prison for it? Also, it really does no good to have a knife if you don't know how to use it. Does your friend know how to use a knife or is she willing to learn and practice? Both of those two issues are far more important than the details of the knife itself. Honestly, pepper spray is a far better choice. It's not going to do permanent damage so can be used aggressively. Go ahead and make a knife. Sounds like fun. Just leave it at home. I don't know, but she already carries a pocket knife with her. but back on topic, as to the knife design, any spear point or drop point dagger pattern that strikes your fancy will make a good defensive knife, but from a HEMA perspective, short of john clements magic dagger blocking skill the only time you want to use a dagger is the other guy came bare handed to a knife fight (and is a legitimate threat of great bodily harm yadda yadda where using deadly force is the last available option) otherwise you'll probably both go to the hospital or die on the scene since it is very hard to successfully block a dagger thrust. Somewhat ironically, with a good carry position a knife can be deadlier to a man with a undrawn gun than that man can be to you, consider how quickly a human can close a 10ft gap. Here's an article & thread on making a knife from an old saw blade. Good luck. Make the knives from your saw blades from a different basis. Its highly unlikely that the knives or daggers you make will need to be relied on in a life or death situation, so either go with your muse or try to recreate an historically supported configuration. You're far more likely to make a keepsake or memory for your friend than anything else. My instructor used to say "the winner of a knife fight is the one who makes it to hospital". In other words, it doesn't matter how good you are with a knife, if you get into a knife fight then you are going to get hurt. I agree, even for a soldier a knife will be used 99% of the time for utility purposes, not combat. That said, I agree with Mr. Tom King about shape, a good drop point or spear point is hard to beat for a general purpose utility knife, I would suggest a blade of no more than 5 inches for practicality and ease of carry (I'd consider 3 1/2 to 4 inches ideal for a fixed blade knife that will be carried daily). Though a double edge is cool, it is lacking a bit in practicality ( you cannot use the back of the blade for applying pressure), does not add considerably to the defensive value (at least without special training), and will make the blade illegal to carry in most places.... I suggest you stick with a single edge. 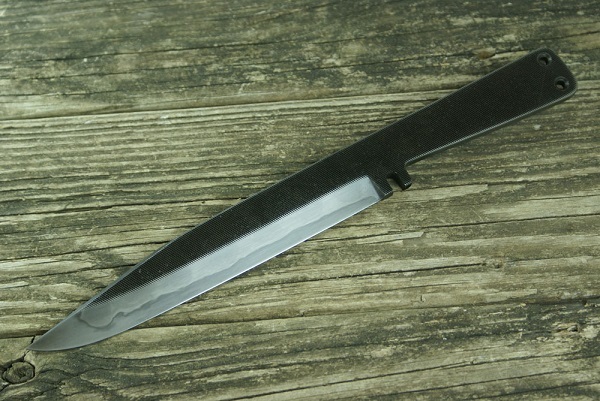 A dropped edge (the edge below the centerline of the handle, like a chef's knife) or a minimal guard would be more practical than a double guard, IMO. How in the hell would the number of edges matter so much that double edges blades have been deened illegal to carry? Well, if you're "fighting" with a knife then you've already screwed up. If you're squared off with somebody, knives out, (as unlikely as that would be) you should be looking to escape. It's properly used as an ambush weapon (or counter ambush) - in other words, by surprise. You don't reveal the knife until you use it. And when you do use it, it should be to kill. The legal problems that could get you in are obvious. As I mentioned earlier, a woman could pepper spray a guy who was putting his hands on you in an unwelcome manner. Of course you could still end up in trouble, but nobody will be dead. Using a knife means waiting to make sure you need to use deadly force. It just puts a person at greater risk. Brandishing the knife might deter an assailant, but might also get you shot. Plus you just gave away your best weapon of surprise. You really need to know what you're doing or you could be putting yourself in *more* risk as opposed to less. Thanks, and good points all. If I make sgian dubn type knife for I'll have to be very careful because Dirks are design descendants of the ballock knife and I would imagine giving a phallic hilted weapon so her along with any other lady of good repute would a quick way to anger them and have your work thrown away. Its a great utility shape and has been used as a weapon through out history, also much easier to explain as a edc, ie I use it to cut fruit for lunch. More sheeple friendly. If she already carries a pocketknife, she seem to be a practical minded girl, so as others have suggested, a nice utility-type knife in a handy format would fill the same role, as well as being made by a friend. Who would not like that? As a Scandinavian, I must of course recommend a pukko-style blade, and you can go to town using fancy materials for the handle and/or leatherwork for the sheath. A lot of states have a dirk and dagger clause. A dirk can be read as any fixed blade over a certain length. At that point (and if planning on concealed carry for defense/offense) it does not matter one whit whether there is one edge or two. As to the utility of a dagger ^^^ or sharpened clip over a single edge is that there are two edges. As to double guards or not, certainly Ek proved none is needed if the handle design is good. However, a double guard and even a subhilt have their merit for both pushing and drawing. Again, a broader than narrower blade will have more utility as often having a good belly to cut with. Certainly, wherever one is planning on carrying a knife one will want to keep the law in mind but I can think of only a very few US states that permit carrying a knife for the purpose of self defense. While one may just receive a slap on the wrist and lose the knife, there are instances where fines and jail time could be extremely unpleasant. I don't think the original premise was to engage in knife fighting, or I too would have mentioned the futility of that. However, if someone is determined to carry a knife to inflict bodily harm, be prepared to use it. Dirks are design descendants of the ballock knife and I would imagine giving a phallic hilted weapon so her along with any other lady of good repute would a quick way to anger them and have your work thrown away. This seems a bit of silliness to me, as many women have a friend working just like a Trojan. As seen on TV. I'm assuming you're in the US? In that case, if she is serious about self defense, I would advise her to get CCW permit and a pistol instead of a knife. Maybe you could go along to the classes with her as a friend? They aren't terribly expensive, ~$100 (in Louisiana at least). However, making a knife can still be a fun and interesting enterprise. For a 'fighting knife' I would choose a stiff, straight bladed design, with a blade length from at least wrist to finger tip (though preferably longer). Remember, never cut when you may thrust! A dirk, rondel, or ballock knife would all be effective fighting knives. For something a little more concealable, consider a Fairburn-Sykes style design, or a boot knife as already suggested. On non-historical knives I'm a big fan of micarta over traditional wood/bone/horn scales. Micarta is lighter, tougher and affords a better grip in my opinion. It is also easy and fun to make. You should try it. EDIT: Sorry, I read too quickly and missed your criteria for utility. In that case, the closest combination of utility and combat would, in my mind, be a seax. These can vary in length and shape but you should be able to find plenty of examples. For pure utility, nothing beats the puukko imho. [quote="Ian Hutchison"]I'm assuming you're in the US? In that case, if she is serious about self defense, I would advise her to get CCW permit and a pistol instead of a knife. Maybe you could go along to the classes with her as a friend? They aren't terribly expensive, ~$100 (in Louisiana at least). *Obilatory lame pun* Because everyone needs a little seax, right? it comes up every once and a while about carrying a knife, through personal experience, don't carry it in public. the attitude toward pocket knifes since 9/11 has totally changed. if your at your home or a farm - its ok. if you want to see about the laws in your are about carrying concealed (because a small knife is considered concealed weapon) weapons consult your local library for city ordinances, do not ask a cop or a friend of a law enforcement read the laws yourself to understand them. i make my own knives from time to time as well, so yes it can be a fun project so I'd say go ahead and make it. if it's your first blade take your time make it right. make it a little girly if its for a girl, just remember you may have to live with the shame of being poked with a girly knife if you have a falling out make it something special and something piratical to use - and remove the idea of self defense from the equation. view it more as an elegant tool for hunting/ fishing etc.